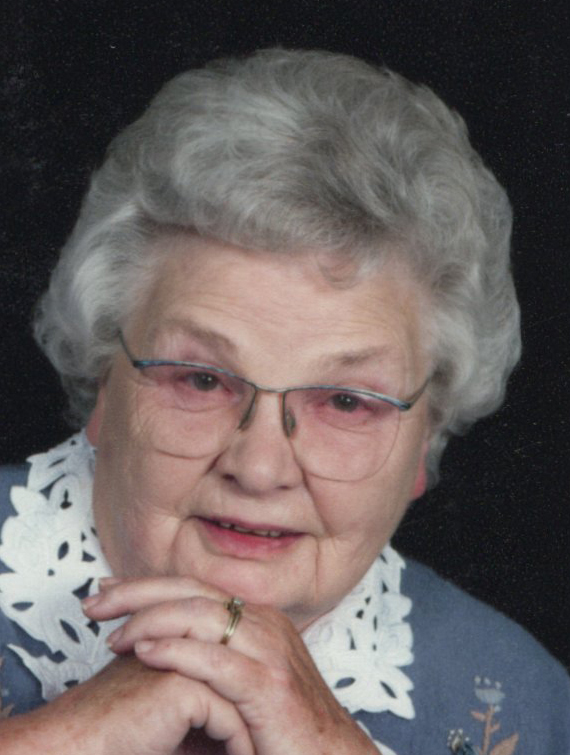 Eileen Ruth Frazier, 91, of Fremont, OH passed from this life into the arms of Jesus and reunited with her husband, Jim, on January 18, 2019. She was born on November 9, 1927 in Riley Township the daughter of the late Walter and Mary (Herr) Frey. She was a 1947 graduate of Clyde High School. Eileen married James B. Frazier on October 1, 1947 in Champaign, IL and he preceded her in death on August 21, 1994. She was a homemaker and Avon Distributor. After their children were married she accompanied her husband Jim who was an owner/operator truck driver, traveling the country spending their latter years together. Upon Jim’s passing she filled her days delivering joy for Hershey Flowers. Eileen faithfully attended Fremont Alliance Church and was a member of Golden Threads. She enjoyed spending time with her girls and especially her grandchildren and great-grandchildren, playing games and family get togethers. Eileen is survived by her daughters, Marie Green, Fremont and Kathy (Raymond) Green, Kansas, OH; brother; Darl Frey, Fremont; grandchildren, James “J.D.” (Lori), Jerry (Jeanie) and Kevin Green and Kristen (Jeff) King; great-grandchildren, Wyatt and Matthew Green and Logan Jacoby. She was preceded in death by her parents; husband; son-in-law, Harley Green; siblings, Juanita Forman, Mabel Cherry, Harold, Ray, Albert, Dale, Charles and Letta Frey. Visitation: Monday, January 21, 2019 from at 4 to 8 p.m. at Wonderly Horvath Hanes Funeral Home, 425 E State St., Fremont, OH. Funeral Services: Tuesday, January 22, 2019; 11:00 a.m. at Fremont Alliance Church, 936 Brush St., Fremont, OH with an hour of visitation prior to the service at the church. Memorials can be made to Wounded Warriors or Camp Courageous through ProMedica Hospice. To Marie and the entire family, be assured that I continue to lift you to the throne of grace of our Lord. I pray for your continued strength over these next few days and beyond, as you reflect on a life well lived. Eileen is now both healed and happy. What a praise ! Sending hugs and prayers to Marie and family. My deepest sympathies go out to you and your family. May God give you the peace that you seek. Our thoughts and prayers are with you all. Thank you Amanda… She was loved so very much. Grandma always called me by my childhood name, “Krissy”. It might sound silly, but I think that’s going to be the thing I will remember & cherish the most. Whether I was getting scolded as a child or we were just having a visit Grandma had a special way of saying “Krissy”. It was always said with love. I wish I could hear her say it one more time. Thank you Debbie… Mom was the absolute best. I cannot believe she is gone, it was all so quick. Your mom was a favorite aunt to my sister, Janie, and me. I didn’t see much of her after I got married because we were ministering in Ecuador but I so much appreciated talks with her at family gatherings when we were in the U.S, She had a gentle manner that helped me to see Jesus in her. So glad I got to see her one more time in September when she was well. We know she is with Jesus and so we also know that we will be reunited with her and my parents, as well. May God comfort you in this time of mourning. We are so sorry to hear of the loss of your mom. She was one of my sister, Janie, and my favorite aunts in our childhood years. I didn’t see her much after I got married because Mike and I were ministering in Ecuador but the time we spent with her at family gatherings when we were in the U.S. was special. She had such a gentle manner about her that helped others see Jesus in her. She loved her family so much. I am so glad that we got to see her one last time in September while she was still well and we had such a good conversation. We know she is with Jesus and one day we will be reunited with her and my parents and have a “family reunion” there.